Note: Adding lyrics is similar to attaching documents, but not the same. You can use this comparison chart to understand the differences. To add lyrics to BandHelper, tap the edit button for a song, then scroll down to the Lyrics field. You can type directly into the field, or copy and paste lyrics from a web page or a document. When typing in the Lyrics field, a toolbar will appear above the keyboard with buttons to sharp and flat symbols and other useful chord symbols. After entering lyrics, you can apply basic formatting—bold, italic, underline, left-align, center, right-align and color—using the formatting toolbar at the top of the Lyrics field. On larger devices that have enough room for it, you can also use a Clear Formatting button (X icon) to remove formatting from the selected text. If you want to include chords within your lyrics, you can surround them with ChordPro-style square brackets. Then BandHelper will automatically color them according to Settings > Appearance > Chords Color. It will also place them above the corresponding words, or inline, according to Settings > Appearance > Bracketed Chords. (The Above option requires Settings > Appearance > Lyrics Font > Monospace.) You can also place instructions like "pause" or "harmony" in square brackets. You can even hide all the bracketed text from the set list view by clicking the document tools button and selecting Hide Bracketed Chords. Your lyrics should only contain square brackets if you intend to use these functions. If your lyrics include chord names that aren't surrounded by square brackets, you can still use the chord color and transpose functions, but there are some cases where they won't work consistently. Also, you can't use a mixture of bracketed and unbracketed chords -- if any chords are bracketed, BandHelper will ignore any chords that are not bracketed. Instead of placing chord names within the lyrics in the Lyrics field, you can enter just the chord progression into the Chords field. This field will then appear above the lyrics field when you view your lyrics, with the lyrics scrolling beneath it. You can resize the chords and the lyrics separately by pinch-zooming on the two separate areas of the screen. You can also toggle the appearance of the chords by tapping the divider line. You can automatically transpose your chords using the flat (b) and sharp (#) buttons at the top of the Lyrics and Chords fields. This transposes all the chords up or down a half-step at a time. To	choose between enharmonic notes, BandHelper will add a sharp if moving to a higher note or a flat if moving to a lower note. So if, for example, you have the chords E A B and tap the sharp button once, BandHelper will change the chords to F A# C. You can change this to F Bb C by tapping the sharp button again to get F# B C#, then tapping the flat button to get F Bb C.
After saving the song, a document button will appear next to the song whenever the song appears in BandHelper. You can tap the button to view your lyrics full-screen in most windows, or within the document viewer in the song view in layouts that contain a document viewer. Swipe up or down to scroll through long lyrics, or tap the top or bottom third of the lyrics to jump to the previous or next page. Tap the left or right third of the lyrics to switch to adjacent documents, if documents are attached to the same song. Pinch to resize the lyrics or chords text. 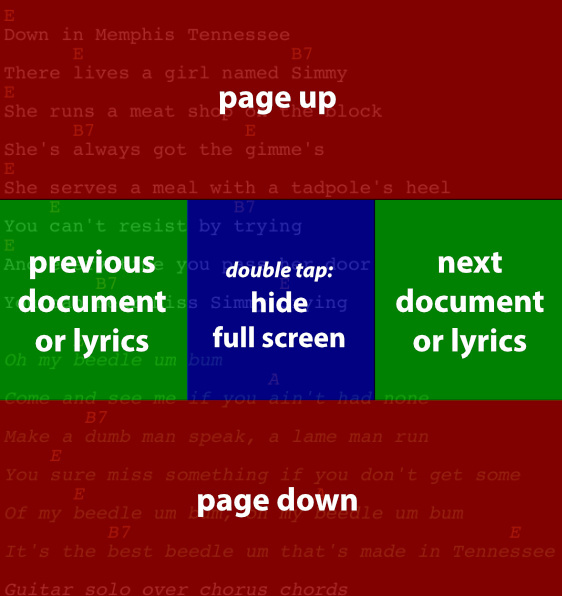 Double-tap the center of the lyrics to expand them to full-screen view. Double-tap again to exit the full-screen view. Tap the document tools button in the top right corner to save the current text sizes, reset the text sizes, show or hide the chords field, show or hide bracketed chords or toggle in and out of full-screen display. From the Songs list only: Tap the Email or Print buttons to email or print the lyrics. You can display your lyrics in two columns if you edit your layout, tap the document viewer, tap its options button in the top right corner, and set Content to 2 Columns. If you are using an external display with an iOS device, that display will mirror your entire screen by default. Alternatively, you can set Settings > General Settings > External Display to Document, and then the external display will only show the lyrics and chords when you view them from within a show. Your show layout does not need to include a document viewer to use this feature, so you could view a list-only layout or other information on your device display and lyrics on your external display. You can select the font used for all lyrics in Settings > Appearance > Lyrics Font. Chords always use the monospace font so that you can align your chords like a chord chart. To	choose between enharmonic notes when transposing, BandHelper will add a sharp if moving to a higher note or a flat if moving to a lower note. For example, if you have the chords E A B and tap the sharp button once, BandHelper will change the chords to F A# C. You can change this to F Bb C by tapping the sharp button again to get F# B C#, then tapping the flat button to get F Bb C.
If you are using the Chords field, or the Lyrics field with the Monospace font, BandHelper will display flat symbols as a "b" character, because a real flat symbol is not sized correctly for chord alignment. You can still use real flat symbols when editing your chords, in case the flat symbol is supported better in future OS versions and this workaround is removed. BandHelper will recognize the letter H for a B chord and the letter B for a Bb chord if Settings > General Settings > German Chord Names is turned on. BandHelper will recognize solfege chord names if you surround them in square brackets in your lyrics. BandHelper supports title case or upper case names (Do or DO) and supports Si or Ti for the seventh note when positioning and coloring, but only supports Si when transposing. If the on-screen keyboard doesn't leave enough room for your content on a tablet in landscape orientation, you can try editing in portrait orientation, or try using the split keyboard on iOS.